Pandanus is proud to have Alec Jones as our resident psychologist. Alec has 38 year of work experience as a psychologist. He attained his educations at the universities in Australia with his master degree from Macquarie University, NSW. He is a member of Australian Psychological Society (MAPS), APS College of Forensic Psychologists (MCFPs) and Australia New Zealand Association of Psychiatry Psychology and Law (ANAPPL). He has worked in and consulted to State and Federal government agencies as well as private organisations in NSW and Queensland. Alec combines a genuine and empathetic counselling style with evidence-based strategy, tailoring his approach to suit each individual and his circumstances. He is passionate and has been successful in helping many people overcome challenges and improve their performances in live. 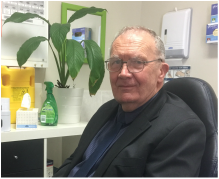 Alec’s wealth of knowledge will contribute to Pandanus Medical Practice’s effort to provide comprehensive and quality services to the communities in Capalaba. Alec looks forward to welcome you to the Practice.